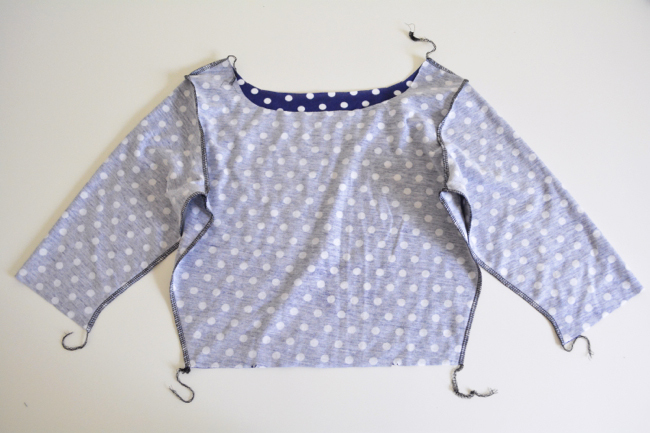 In this post we’ll be going over attaching the sleeves and finishing the neckline for Moneta Versions 2 and 3. 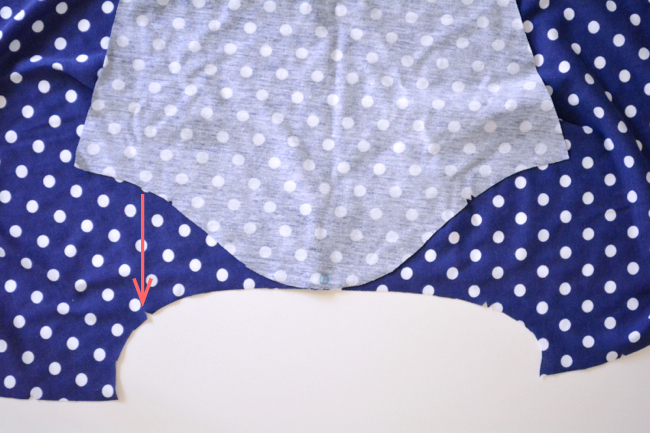 Align the single notch on the sleeve with the single notch on the bodice. Pin. 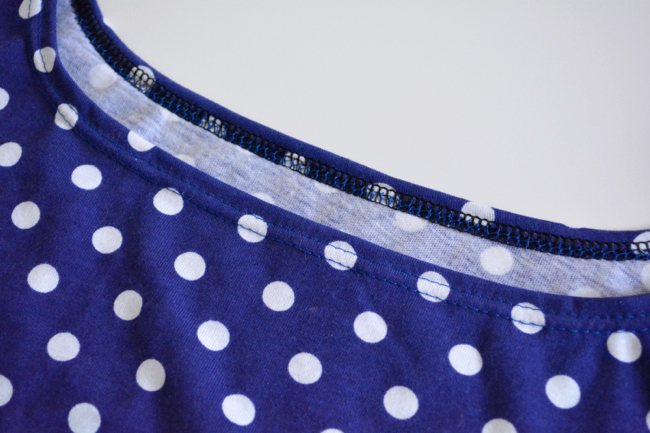 Align the double notch on the sleeve with the double notch on the bodice. Pin. Pin the rest of the sleeve edge to the bodice, lining up the raw edges. You may need to gently stretch the armhole edge to match the sleeve edge (this is called easing). Use lots of pins! 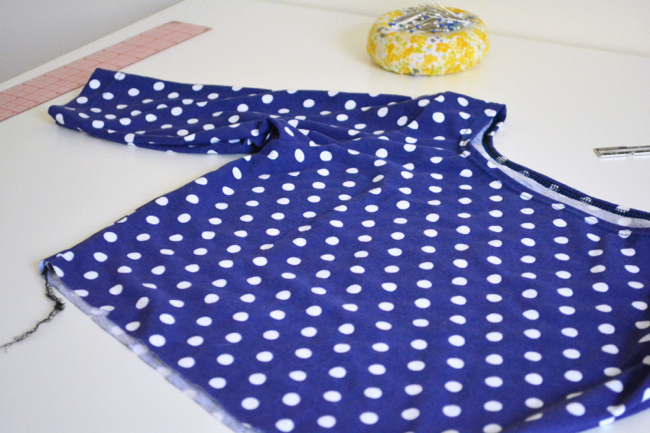 2) Attach the sleeves. Stitch along the sleeve cap edge, making sure the raw edges stay aligned as you go. Repeat steps 1 and 2 for to attach the other sleeve. 3) Pin the side seams. 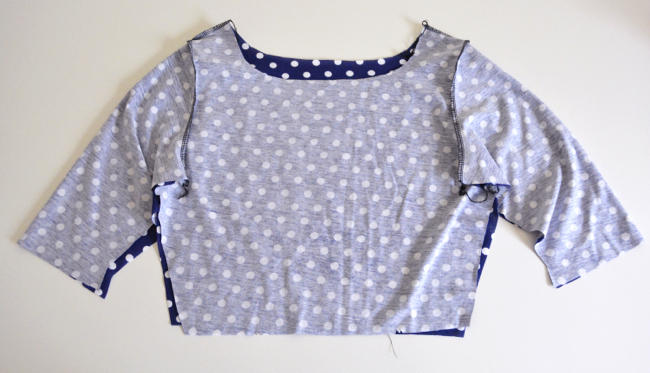 With right sides together, line up the raw edges of the bodice and sleeves, aligning the underarm seams. Pin. 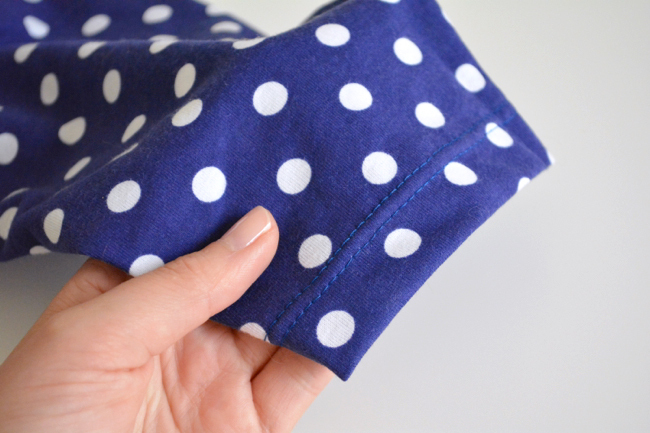 4) Sew the side seams. 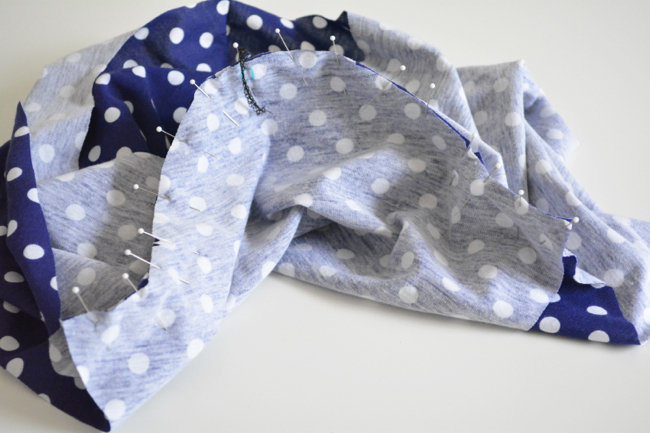 Stitch the entire side seam at once, starting at the waist edge and going past the underarm seam all the way to the end of the sleeve. Repeat for other side seam. 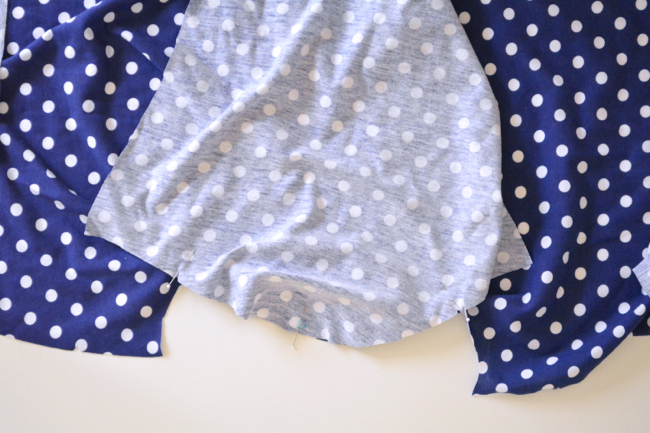 5) Hem the sleeves. Finish the raw edges of the sleeves. Turn them 1” towards the wrong side and pin. 6) Hem the neckline. Finish the raw edge of the neckline. Turn 3/8” to the wrong side and pin. From the right side, stitch down using your twin needle. 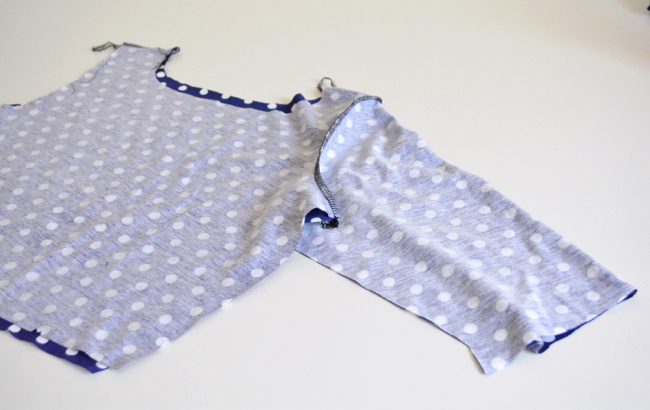 Alternatively, you can use a coverstitch machine or the hemming technique of your choice. 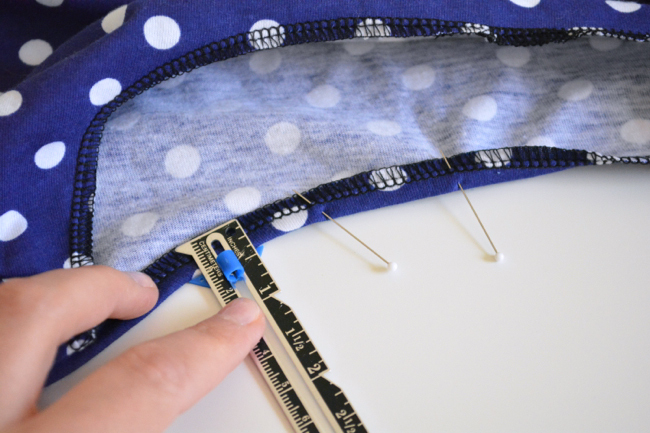 If you’re having trouble with the twin needle, below are a few troubleshooting tips/reminders. You can also check out the twin needle tutorial on The Coletterie. Check your settings. 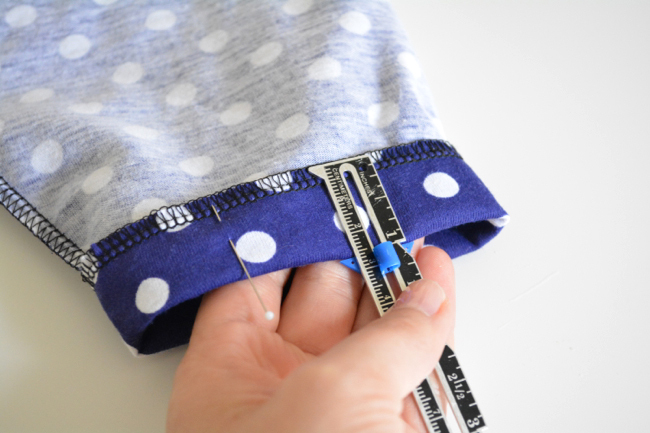 Double and triple check that your machine is set on a straight stitch and that the needle position is centered before you start sewing. I always hand crank through one stitch first to make sure I’m not going to break the needle. Thread correctly. When you thread the two upper threads, make sure one goes to either side of the narrow plate between your tension discs. On my machine this is what makes the difference of a zigzagging or straight bobbin thread. Save on thread. If you don’t want to buy an extra spool of thread just for the hems, just wind an extra bobbin and use that in place of a second spool. That will do it for today! As tempting as it is, I’d recommend resisting the urge to try on your bodice, as you may irreversibly overstretch the bottom edge. See you back on Friday to get started on the skirt! I made two Monetas in no time flat, and found the use of tricot fusible knit stay tape (by Sewkeys E) to be very helpful in hemming the neckline. It curves nicely & is ironed on. I also liked the fusible hem tape (The Sewing Workshop) for the hems on the sleeves & dress bottom. This is great although I didn’t manage to get all things done today. Got up to sewing and neatening side seams. 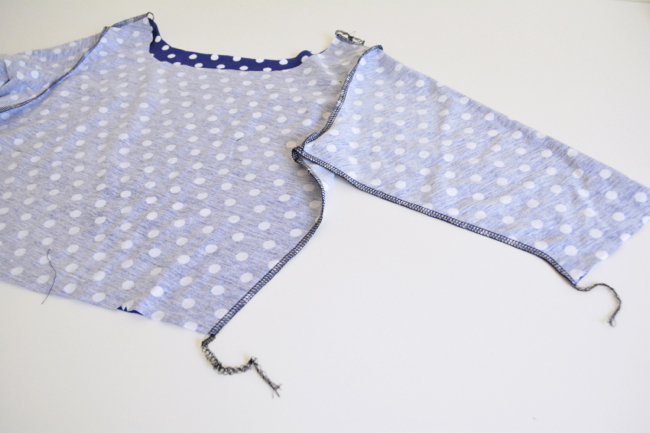 I struggled with remembering which side to lay the seams between the armhole and bodice – I don’t have a serger. You can put the seam allowances in opposite directions to help eliminate bulk. You’ll have time to catch up before the next post! I’m making v3 with the collar from v1. As I didn’t have access to any knit interfacing, I decided to line the bodice as in v1. Does it matter which order I attach the collar and sleeves? Personally, I’d do the sleeves first and then the collar because the collar could get in the way of installing the sleeves. It’s kind of like mixing a cake, it’ll still turn out alright if you decide to do the other order, but it will be less worrisome if you put the eggs in before the milk. I’m using a mock overlock stick for the finished edges, but the stitching doesn’t look nearly as nice as it would on a serger unless I stitch further back from the edge of the fabric. But then the stitching would show in the neckline hem. Is there a way to make the mock overlock stitch look nicer? I like using the 3-step zig zag as a finish on finicky edges because it usually lays pretty flat. It’s the zig zag that looks like little dashes instead of a solid line. You could try using that stitch. 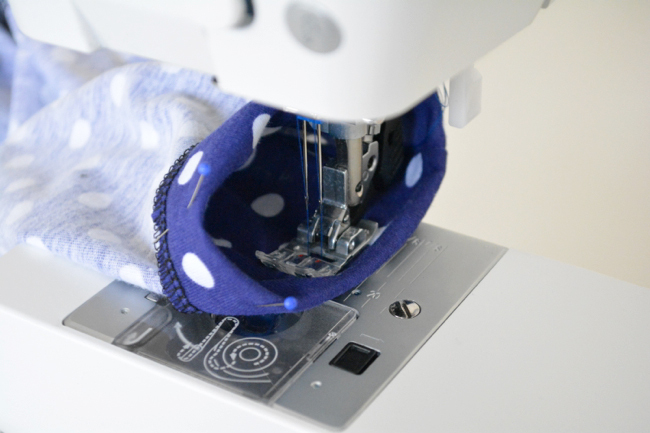 Or, does your machine let you change the settings of the mock overlock? 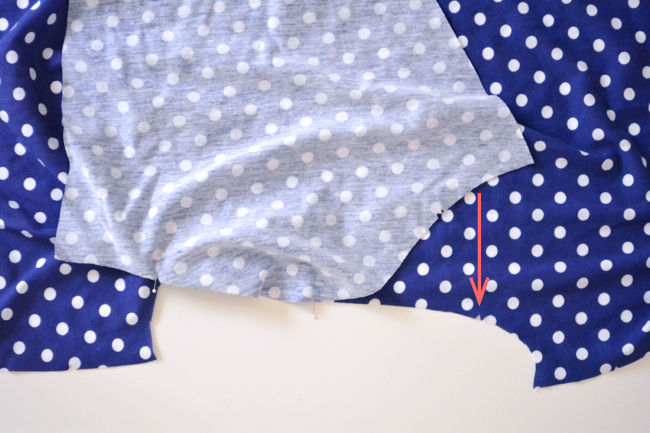 Maybe you could make it a little narrower, and then you could sew in from the edge a little more. Mock overlock gets messy when I’m finishing a single layer of fabric. I will definitely try the 3 step zigzag on the skirt and pocket edges. Great suggestion. Is that normal that I cannot back stitch with the twin needle nor with normal needle when I use the special stretch stitch (it jams each time) ? Which stretch stitch are you using? If you’re using the reinforced straight stitch, then there’s no need to backstitch since the whole thing is really like one big backstitch. 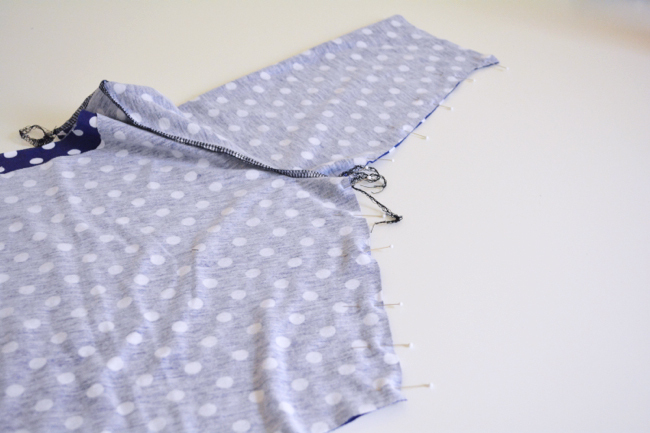 When using the twin needle, you should just be using your regular straight stitch. I guess I use the reinforced straight stitch. For the twin needle I use normal straight stitch, still makes a mess if I back stitch. I have an even more serious problem, I don’t manage to use the double needle because the needles get stuck into the finished edge each time, it makes a terrible mess, what can I do ? At this stage I am thinking to cut the finished edge and redo it without finishing the edge, in order to save the dress..I even use a walking foot ..What do you recommend ? And yes, you could cut off the edge finish and just leave the edge raw, since as a knit it won’t fray. Also make sure that your bobbin is wound and threaded correctly. Thanks ! I didn’t know the honeycombe stitch was used for stretch fabrics. Hi! I just finished the bodice on version 2. I used a stretch stitch on my regular machine. Do I need to finish the seams somehow? Zigzag & trim? The fabric is ITY.